This doesn’t add a lot to what we knew of Elliotsmithia (Broom 1937), but it does provide a canine tooth, and an upturned mandible tip. The question is: is this also Elliotsmithia? Or something else? Figure 1. The new specimen referred to Elliotsmithia. It’s the same size and shares many traits. In the original Elliotsmithia (Fig. 2) the posterior teeth appear larger. The part and counterpart are overlaid here. I’m guessing that the anterior lower dentary is buried here. Otherwise there would be no room for the next erupting tooth to develop. 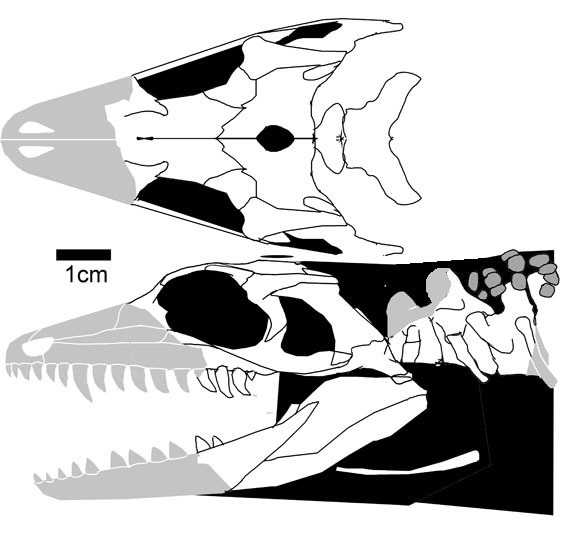 The type Elliotsmithia had giant serrated teeth and a forward leaning squamosal. Even so, this is a very close match in most respects. Figure 2. The type of Elliotsmithia. Those are really big teeth beneath the orbit. The pineal is more centrally placed. And the jugal appears to lean in more. Elliotsmithia nests at the base of the Synapsida in the large reptile tree. As such it represents the most primitive appearance of the lateral temporal fenestra, but not the earliest. Living among therapsids in the Middle Permian, it was a relic taxon, like the living Sphenodon. Broom R 1937. A further contribution to our knowledge of the fossil reptiles of the Karroo. Proceedings of the Zoological Society, Series B 1937:299-318. Modesto S, Sidor CA, Rubidge BS and Welman J. 2001. 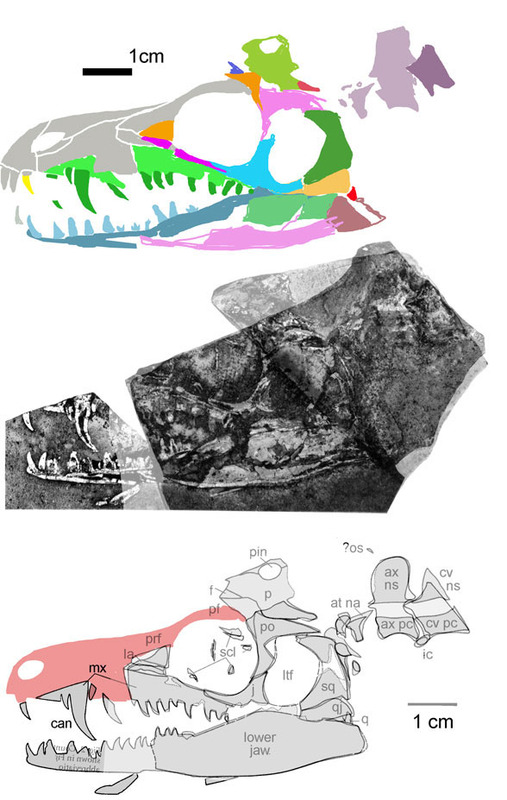 A second varanopseid skull from the Upper Permian of South Africa: implications for Late Permian ‘pelycosaur’ evolution. Lethaia 34: 249-259. This entry was posted in pelycosaur, reptile family tree, synapsid, varanopids and tagged pelycosaur, synapsid, varanopids by davidpeters1954. Bookmark the permalink.